Fourth bout of the night, see Ben McGivern face Latvia’s Eduards Gerasimovs in a six rounder. McGivern swept across the ring like a force ten gale and just let rip with huge rights and lefts, Gerasimovs tightened his defence in an attempt to withstand the vicious assault, but when that just wasn’t holding back the banzai Scot, changed tactics and bravely went toe to toe, which instead of having the desired effect just played into McGivern’s hands – literally – and the Scot just began punishing the Latvian with power shots to body and head. As the Round entered the final minute McGivern stepped it up a gear and basically backed Gerasimovs onto the ropes and began targeting the body of the Latvian again, and once more landed a seriously big body shot to send the Gerasimovs down for a second time. McGivern started off the second the way he ended the first, full on attack, Gerasimovs was holding his own for the first twenty seconds or so, even though he was backed on to the ropes, but then left the smallest of openings and McGivern was in like a flash switching from left-rights to the head to slipping in a solid body shot that sent Gerasimovs down for a third time, this time though he wasn’t able to rise in time, leaving Referee Liam Bonner no option but to wave the fight off on the twenty nine second mark of the second round. The fifth and final contest of the night pitted Kick Boxing World Champion Jamie “Ginnie” McGinnis in his second pro boxing bout against Vladislavs Davidaitis in a four rounder. 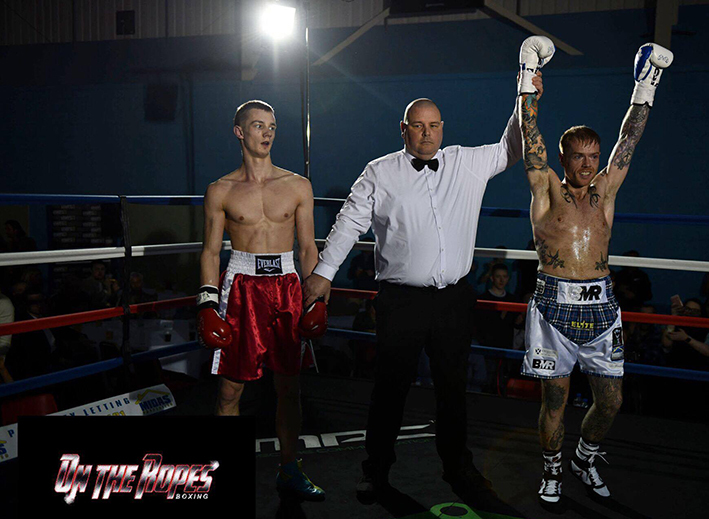 Right from the start of the third McGinnis went on the attack and again backed Davidaitis onto the ropes and began another double-handed assault, Davidaitis once again resorted to absorbing the punishment and countering when an opportunity arose. Davidaitis managed to spin away and then use his jab to keep the ever forward coming Scot at bay, then just on the minute mark McGinnis threw a sensational right to the chin that sent Davidaitis crashing to the canvas, his head going under the ropes and over the ring edge, to all ringside without doubt it looked like a definite knockout, and probably a bad one so nobody was surprised when referee Liam Bonner waved the fight off on the one minute and one second mark of the third, but just as he did the seriously tough Latvian stirred, raised his head and started to rise whilst complaining that he was OK and the fight shouldn’t have been stopped.